28-Aug-2016 -- While driving from Moab, Utah back towards my home in the San Francisco Bay Area, I stopped by this remote Degree Confluence Point that had not had a recorded visit (on this site) for more than 11 years. After passing through the small town of Delta, and the even smaller town of Deseret, my GPS receiver’s navigation software directed me onto a series of increasingly rough gravel and dirt roads; the last of which ran north-to-south along the eastern edge of Sevier (Dry) Lake. This road passed just 0.42 miles east of the point, leaving an easy hike across the desert. 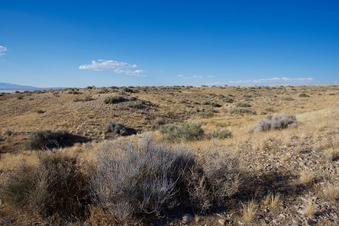 #5: The confluence point lies in desert terrain near the eastern shore of Sevier (Dry) Lake. A piece of broken electronic equipment marks the point.